OTTAWA, May 2, 2016 /CNW/ - The Honourable Jane Philpott, Minister of Health, today announced an investment of $16M over five years to support new research that will help find new ways to prevent or treat chronic conditions affecting millions of Canadians. It is commonly understood that both environmental and genetic factors play a role in the development of chronic conditions such as asthma, diabetes, and inflammatory bowel disease. A child with asthma, for example, can inherit a genetic predisposition to the condition from their parents and episodes can be triggered from breathing in irritants like pollen and cigarette smoke. But how exactly genes interact with the environment to contribute to these health conditions is not well understood. To close this knowledge gap, the Government of Canada, through the Canadian Institutes of Health Research, is funding eight new research teams. 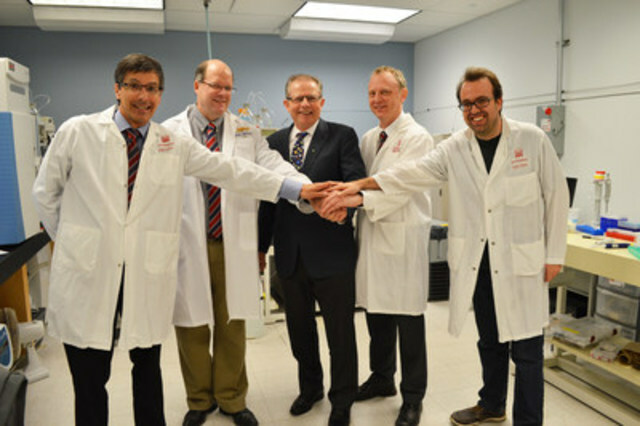 Funding partners for select projects include Genome BC and Crohn's and Colitis Canada. These teams will advance our understanding of the complex interaction between our genes and the environment in which we live and guide the development of new approaches to prevent, treat or better manage chronic conditions. Their work promises to improve the lives of Canadians and reduce the burden on our health care system. "Millions of Canadians, such as our children, seniors, family and friends, live with chronic conditions, affecting their quality of life and placing a great deal of stress on their loved ones. We are pleased to support these outstanding research teams that will produce important new knowledge and help make life better for Canadians living with chronic disease and their families. I wish the teams every success as they carry out their research projects." "Most chronic diseases, such as diabetes, inflammatory bowel disease and obesity, involve multiple genes in complex interactions with environmental influences. New technologies have emerged that provide researchers with a greater understanding of the genome, the epigenome, the microbiome, and the metabolome. This research funding will enable researchers to use these new technologies to better understand the complex interactions that cause chronic disease, and ultimately help us to identify better ways to prevent and treat chronic disease conditions." "Predicting and preventing chronic disease is the kind of real world challenge that 'omics' technologies can help tackle. By mapping the DNA of a patient's complete environment, new insights and approaches can be created to reduce the burden of chronic disease, We are proud to be supporting world class researchers as they push boundaries towards a future that offers solutions with unparalleled efficiency and precision." "Canada has among the highest rates of inflammatory bowel disease (IBD) in the world. Increasingly we are seeing families new to Canada developing IBD for the first time – often within the first generation. This research will shed new light as to how our Canadian environment and diet contribute to the development of Crohn's disease and ulcerative colitis, and brings us closer to new ways to prevent and treat these diseases affecting nearly 250,000 Canadians." The Government of Canada, through the Canadian Institutes of Health Research, and its partners Genome BC and Crohn's and Colitis Canada, is investing $16M over five years to support eight research teams working in the area of environments, genes and chronic diseases. The teams will advance our understanding of how genes and environmental factors such as air pollution contribute to the development of chronic conditions. The results of their work will provide evidence to guide the development of new treatments and prevention strategies.